Kitahama Onsen (Termas) is a large hot spring facility opened in October 1998. “Tetmas” means “bathhouse” in Latin. In the facility, you can enjoy various hot springs such as steaming water, mist sauna, open-air bath, waterfall shower and more. 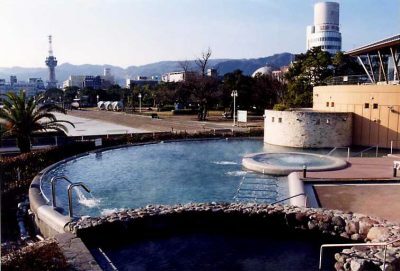 The open-air bath area is uncommon in the hot spring resort Beppu Onsen where bathing suit can be worn. The second floor is a place that you can relax after bathing in a rest room of tatami floor. At the open-air bath and the rest room, you can see the first sunrise “Hatsuhinode” in New Year day.